The insulation of your home, particularly in your attic, is the barrier that keeps in the heat and air conditioning you pay for. Without it, the temperature of your home would constantly be fluctuating, and you'd be losing tons of money on energy spending as the heater and AC attempted to compensate. 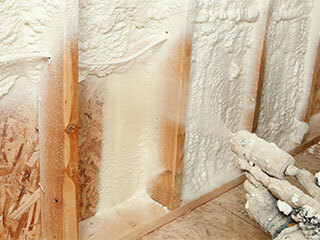 However, even with insulation installed, it can't completely seal your home so that no air escapes. So, unfortunately, there's always leakage that wastes some of your energy. Until now, at least! Spray foam insulation can, in fact, completely seal your attic to make it airtight, therefore stopping this constant leak and lowering your energy costs! This is due to the fact that it's applied as a thin film over the desired spot, which then quickly expands to fill up the area. Where regular insulation like fiberglass sheets will inevitably leave a crack of space, this will spread and grow to ensure that there isn't any. There are more benefits as well! This tight seal also makes it so that bugs will be unable to wriggle in and infest your attic to cause damage or otherwise. There's also a type called closed cell that won't absorb moisture at all, which means you no longer have to worry about mold and mildew invading your attic. While you might be tempted to DIY, it's best to let professionals handle things! Our skill and knowledge mean that it will be done faster and we guarantee a job well done. Spray foam applied incorrectly can lead to accidental space, thus severing that airtight seal, and can also damage wood if it expands too close to it. Professional gear must be worn for safety, and there may also be the need to scrape off excess material. We can tend to all of this for you, no problem! It's about time you started lowering your energy bill. Call our experts Attic Cleaning Hayward today and we'll take care of it for you! Ask about the professional attic and crawl space cleaning and decontamination services we have to offer while you're at it.